Scruffy and Lindz from Set To Stunning posted a video about the recent Her Universe Fashion Show open call event in Hollywood. They talk about the atmosphere, the number of attendees, and how the event is encouraging fans to design and create their own geek fashion – check out the video here. 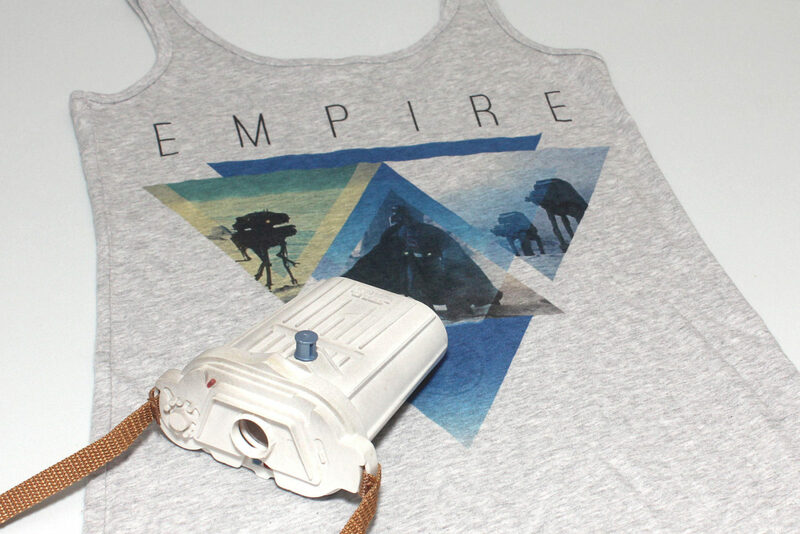 Emily from The Stylish Geek has a blog post featuring her ‘Lady Ren’ outfit, with the Kylo Ren tank top available from Hot Topic. I really love her outfit styling – that pleather skirt coordinates so well with the top! The finalists for the Her Universe Fashion Show have been chosen and notified, and some of those who didn’t make it in this year have posted their design sketches on Instagram. There were some fantastic Star Wars concepts – theladynerd designed this stunning Rey themed gown, gryffmintdor designed a cute Poe Dameron themed outfit, zephyrmakesthings designed an amazing Grand Moff Tarkin themed outfit, and mistygillespie designed two Star Wars looks, inspired by Boba Fett and Chewbacca! English actress Anna Brewster, who played the First Order spy Bazine Netal in ‘The Force Awakens’, is featured on the cover of the June 2016 issue of Tatler magazine. The headline article is titled ‘Force Of Nature – how Anna Brewster went from Star Wars to Chanel’. While the magazine’s website doesn’t include any further information besides the cover, The Daily Mail website has quotes and photos from the full article – read more here. Fashionably Geek posted an article about a fantastic Boba Fett inspired colored hair style! While the stylish Anya Goy used a man to demonstrate the look, I can see this as an amazing accent to a woman’s geek couture look! With multi-colored hair so popular now, I would love to see more fans rocking Star Wars inspired colored hair – see photos of the Boba Fett style here. If coloring all your hair is a bit too bold, you could try out a small design – like this great tutorial from Blondsaurus. Instagram user justbetsycostumes has posted a few photos of her ‘dapper day’ style The Force Awakens outfit. She created the dress herself, and styled it perfectly with a pin-up style First Order officer hat. The orange/white/black colour scheme works so well together, topped off with the Loungefly Captain Phasma handbag. I’m looking forward to seeing more Star Wars inspired Dapper Day outfits at Disneyland on Sunday – like this teaser of a Darth Vader inspired outfit.